I’m a multi career changer, so I have a bit of a crooked path to where I am now, with Manitoba Agriculture, Food and Rural Development. I grew up, at least the early years, on a farm in north-central BC. I’m coming home in a couple of ways – one I’m moving back into agriculture, and two I’m moving west again. I have a PhD in the field of neuroscience. My first career zig was to leave academics for the environmental movement. Indirectly, that career decision led me to organics. I was advocating for the federal Species at Risk Act – SARA, and had developed a proposal called Living with SARA about working with producers rather than against them to protect species at risk. As part of this million dollar project, I started working with landowners in agricultural landscapes to develop solutions for many of the species imperiled because of agriculture. That got me into what I now consider to be a solution of modern problems - organic agriculture. One of our stewardship projects was a demonstration organic farm on Pelee Island, which is the southernmost point in Canada and has all kinds of indigenous species that are found nowhere else. The organic farm placed a priority on biodiversity, with the goal of creating quality habitat for species at risk. It also served as a demonstration of best management practices for other island land owners. From there, it wasn’t a huge leap to organics. I took a position with Canadian Organic Growers and I’m now working in the Manitoba Government as an organic specialist. Can you briefly explain your Research Activity in Organic Science Cluster II (OSCII)? We’re trying, for the first time ever, to shine a spotlight on the Canadian organic food processing industry. Some work has been done in Europe, but it’s the first time that anything like this has been done in North America. Most of Canada’s research efforts in organic are related to primary production, so it’s time that we started to focus some of our research energy on organic food processing. Organic food processors face all of the same challenges that anyone who is a food processor faces, with a whole bunch of additional challenges. When I started looking at this, it’s actually kind of amazing that we have any organic food processors, because the policy barriers are huge, as are the technical constraints - it’s almost as if we’re asking food processors to tie one hand behind their back or wear a blindfold when they’re trying to create new products. Some of the barriers are due to a very limited number of permitted substances within the Canada Organic Standard. When you create a processed food product, you have to think about factors such as shelf life, food safety, and appearance, in addition to taste and nutrition. In mainstream food processing, there are many food additives, such as stabilizers, emulsifiers, nitrates, etc. that help achieve these goals, but organic food processing has a limited number of tools in the box, requiring processors to be extremely innovative. There are also challenges sourcing organic ingredients and scale appropriate equipment, not to mention finding consultants with the needed expertise in organic processing. I wanted to look at these challenges and how Canadian organic food processors are overcoming them. The second part of the study is to then take some of the common challenges and find solutions. When we were doing pre-research for this project, we discovered from talking to food processors that shelf life is a huge challenge. So, we’re starting with that. 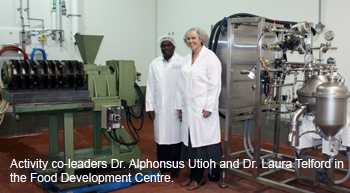 We have a couple of partners from Manitoba, and we’re working at the Food Development Centre (FDC) to try to find solutions to these shelf life and other challenges that the food processors are raising. Ultimately, we’ll be able to work with real-life food processors and produce some foods in a new way and, in doing so, develop some technical solutions that aren’t out there. What brought you to this research, and what excites you the most about this project? I too, like most of the OSCII researchers, have mostly worked on production and marketing, and I’d say that 98% of the energy in the organic sector in Canada is focused on the production issues. But when you think about it, what drives production? What’s the market, and what’s the reason that anyone would want to grow the food? Well, there’s the fact that people want to eat it, but when it comes down to the everyday mechanics of how the food gets to the consumer, usually a food processor is involved. 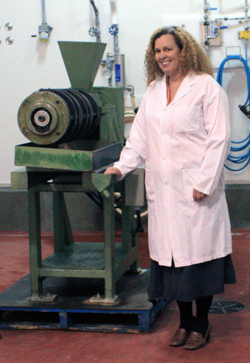 We know from the conventional food world that processors like to use about 75% of their ingredients from Canada. It’s much easier for food processors to buy product from right down the street - it’s cheaper, fresher, and just easier to use, and they have relationships with ingredient suppliers. So, it’s interesting in the organic sector to look at food processing as a driver of production. Most of my 10 year career in the organic sector has been about driving producers into organic production, but there’s no driver quite like the market. If you can create some kind of accelerant for the food processing industry, you can create a huge market for organic production. So, I’m excited about the project because of its potential to accelerate the conversion to organic production. How has this Research Activity expanded your traditional research program? Well, in Manitoba, I’ve been hired as the marketing person. As a result, I started working with more retailers and processors because they are the local market for organic products. As I became more interested in them and got to know them better, I started to talk to them about what their challenges are, and I now realize that those challenges are monumental. Where is your project taking place? Are there factors that make this location especially suitable for your work? The reason I took on this project in the first place was because I’m physically situated at a Food Development Centre, and it happens to be one of the only organic food development centres in the country. It doesn’t exclusively focus on organic, but it does a lot of organic work, and it has certified organic status. Because I’m serendipitously sitting at this location, I got to meet colleagues in the food development sector, and have, as a result, learned a lot more about food development than I would otherwise. When you talk to colleagues, you share ideas; that is why academics are moving physicists next to English teachers, because you get this kind of serendipity. So, it’s been good for that part of the project. The clients that FDC works with could technically be from anywhere, but the reality is that they want to have a hand’s on role in the project, therefore it makes sense for them to be from Manitoba, so that they can come to FDC and talk with the staff. Once FDC has developed prototype products, the products will be sent to their facilities for further testing, so there’s some back and forth there that requires some physical proximity. I think that this project will be useful to the producers primarily as a market. As we overcome challenges to organic food processing, we’ll see new entrants, which in turn will require more and more local organic ingredients. Here in the Prairies, producers are tired of sending their products out on the export commodity market, and they would like to see some local food uses being developed for their products. Here in Manitoba, we have the Manitoba Agri-Health Research Network that is identifying Manitoba foods that have a health benefit. They’ve identified a number of foods, and in conjunction with the Food Development Centre, they’re turning those healthy foods into value added foods, and are then testing the benefits of these foods on patients at St. Boniface Hospital. It would be great for commodity producers here if we could turn their foods into new, nutritious products for which we could not only develop a value-add, but also show the health benefits. The industry partners came to us. We put out a call for people who needed some technical support to create new organic food products. The partners are driving the research because it is very industry-centric. We do have a close relationship with the University of Manitoba, which has a degree program that turns out professionals for the food processing industry from which we have a couple of undergraduate summer students coming almost every summer. I also have an undergraduate STEP student who will be helping with follow up on the survey. For more information on Dr. Telfords’s work in OSCII, please visit http://www.dal.ca/oacc. A print-friendly version of this article is available here [PDF - 345 kB].